When I think about “life” and what it means, I remember back to the dawn of the new millenium, when I delivered my second son. We had gone to Baylor Irving Hospital to be induced into labor early on a weekday morning. My doctor was there and explained to me that the Irving School District had a program where students interested in the medical field could shadow doctors during their patient visits, if the patient agreed. There was a student who thought he might want to become an OB/GYN, so he wanted to attend a birth. Would I allow him to watch me deliver this baby? I am not a particularly shy person, and having already delivered one child with a ton of people in the room, I wasn&apos;t bothered by the thought of a complete stranger being there. I remembered back to when I was in school, and how cool that would have been to be involved in real medical “stuff”, so I agreed. What a cool learning experience, I thought. The student was a young man. He came into the labor and delivery room dressed completely in scrubs–gloves, stretchy hat, and all. Then my doctor entered the room, and he basically had on what looked like a hazmat suit, including the plastic face shield. It was like the movie “Outbreak”. I would have laughed if I weren&apos;t in the middle of contractions. As the contractions got closer together, and after I&apos;d had my epidural, my doctor started talking with the young student, who looked to be about 17. My doctor was an old family friend (my mother-in-law had taught his children when they started kindergarten) and so I was really comfortable with him. He&apos;s a personable guy, so he was trying to put the young man at ease. He began talking about why he chose obstetrics for his medical field. I listened closely to focus away from the pressure building in my body. Now things were getting really interesting. My contractions had pulled together to form one continuous amount of pressure, and the baby was on his way! The student was still interested, leaning in to hear my doctor speak. “Hold on, let&apos;s get things moving.” The doctor bent down to do something, and the pressure released slightly. It must have been getting rather hard to watch, because the young man began to look pretty squeamish. He was getting paler by the moment, and his eyes were very wide. As if on cue, my son Caden slipped from my body and into the hands of the waiting doctor. I was thrilled and tired and happy, but I did look up at the student at that moment, and he looked as if he was going to faint. I&apos;m not sure he heard the message that day, but I sure did. Babies are from God. Life is from God. To be able to aid that in any way, to be able to help a mother birth a child…is to be the very hands of God. 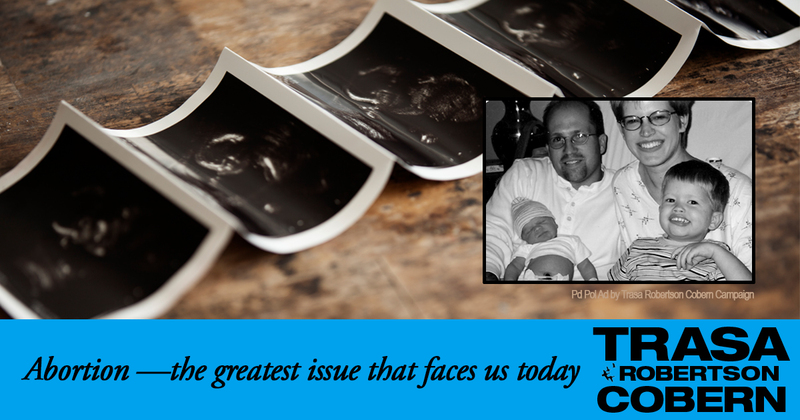 I&apos;ve never forgotten that message, and that is one reason I&apos;m so committed to the pro-life movement. My husband and I have donated money to our local crisis pregnancy center and are involved with it on a personal level as well. This is the single greatest issue, I believe, that faces us today. I want to be the hands of God…don&apos;t you? I pray every day for the end of on-demand abortion in our country and our world. Commit to being the hands of God in your society. Write your representatives, at the state level and at the federal level, and let them know that you support legislation that will end the scourge of abortion. Commit to being the hands of God in your community. Donate to a pro-life group. Volunteer at your local crisis pregnancy center. Commit to being the hands of God in your family. Think about fostering or adopting children who are already here and need someone to show them love. Being the hands of God requires that you take action. Hands don&apos;t sit idly by, they move and shake and hug. So be active, be vigilant, and be prepared. God needs more hands. Please sign up to stay informed with the form below or Click Here to join the team and volunteer to help the campaign. Please Note: You will be sent an email from [email protected] with a link to use in confirming and validating your information. Also, check out Trasa’s other Personal Stories, her Service & Experience and her Background. See why she loves Texas and Tarrant County.